Take this medication by mouth with or without food as directed by your doctor, usually once or twice a day. If you are taking this medication once daily, it is usually taken right before bedtime. 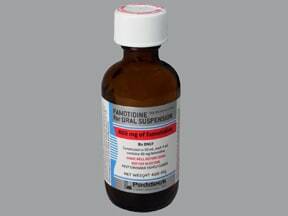 Shake the bottle well for 5 to10 seconds before each dose. Carefully measure the dose using a special measuring device/spoon. Do not use a household spoon because you may not get the correct dose. The dosage and length of treatment are based on your medical condition and response to treatment. In children, the dosage may also be based on body weight. Follow your doctor's instructions carefully. 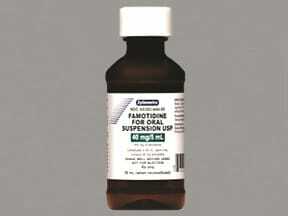 What conditions does Famotidine Suspension, (Final Dose Form) Peptic Ulcer Agents treat? Tell your doctor right away if you have any serious side effects, including: easy bleeding/bruising, fast/slow/irregular heartbeat, signs of infection (such as sore throat that doesn't go away, fever, chills), mental/mood changes (such as agitation, confusion, depression, hallucinations), seizure. 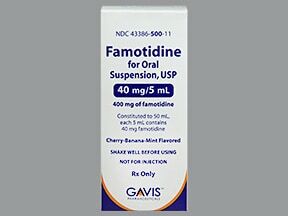 List Famotidine Suspension, (Final Dose Form) Peptic Ulcer Agents side effects by likelihood and severity. Before taking famotidine, tell your doctor or pharmacist if you are allergic to it; or to other H2 blockers (cimetidine, ranitidine, nizatidine); or if you have any other allergies. This product may contain inactive ingredients, which can cause allergic reactions or other problems. Talk to your pharmacist for more details. Before using this medication, tell your doctor or pharmacist your medical history, especially of: immune system problems, kidney problems, liver problems, lung diseases (such as asthma, chronic obstructive pulmonary disease-COPD), other stomach problems (such as tumors). What should I know regarding pregnancy, nursing and administering Famotidine Suspension, (Final Dose Form) Peptic Ulcer Agents to children or the elderly? Does Famotidine Suspension, (Final Dose Form) Peptic Ulcer Agents interact with other medications? Store at room temperature away from light and moisture. Throw away any unused medication after 30 days. Do not store in the bathroom. Keep all medications away from children and pets.